Just popping in to say that we are doing a run of our handmade Christmas advent calendars in time for the holidays. They are available for pre-order now until November 22 and will ship on December 2. 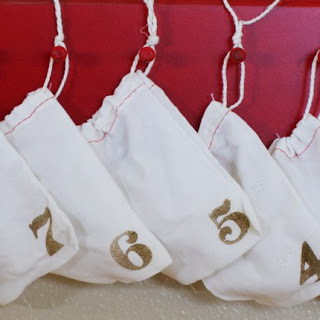 Each advent calendar has 12 drawstring pouches printed with numbers from antique rubber stamps which hang from a wooden peg rack. The peg rack comes in red or white (white not pictured). This is a 12 days of Christmas advent calendar. Starting December 13, open one pouch a day to countdown the days until Christmas. Makes a fun keepsake/tradition. 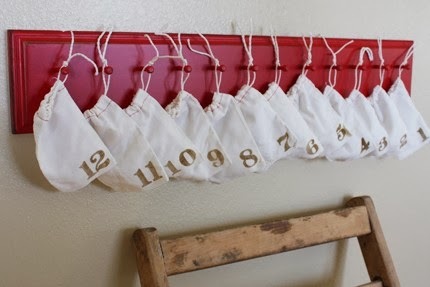 The advent calendars are 4-1/2" H x 26" W x 1-3/4" D. The back has keyhole slots in the wood for easy hanging. Each pouch is approximately 3" x 5" for holding little treats. Click here to pre-order and let me know if you have any questions...thanks!